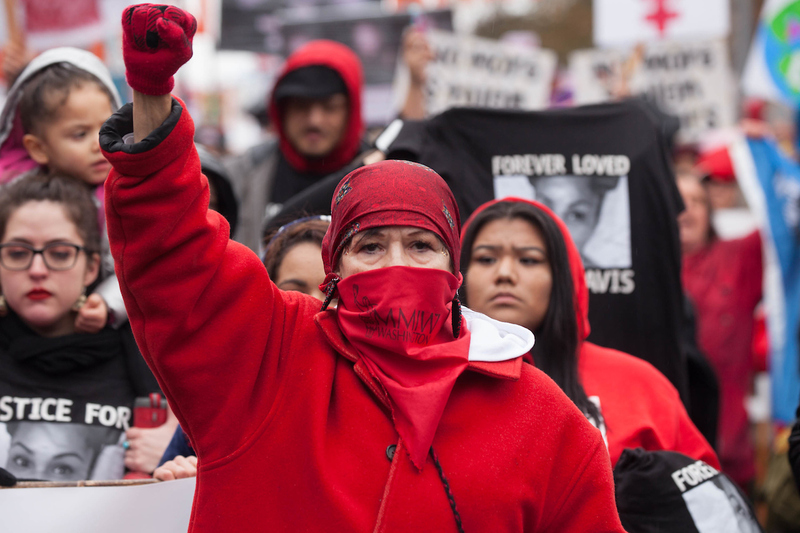 Member of the Murdered and Missing Indigenous Women’s group at the Seattle Women's March, Jan. 20, 2018. This era is one of the most productive in terms of women speaking out against abuse and violence, but the stories of minorities are still being hidden. Native American tribes carry the weight of an abundance of these stories. Ashley Loring-Heavy Runner is one victim. Her sister, Kimberly, has been searching for her since she went missing from the Blackfeet tribe reservation in June 2017. The search area is bigger than Delaware and includes many closed off roads which can only be viewed via Google Earth, which makes the search for Ashley that much more difficult. Ashley Loring-Heavy Runner went missing at 20, but she is not the only one. In 2018 alone, over 24 Native Americans went missing in Montana, most of whom were women. Senators Jon Tester and Steve Daines from Montana want to introduce a bill that will help this issue. “Native Americans in Montana and across this country are dealing with violence at a much higher rate than the rest of the population,” said Tester during a Senate Indian Affairs Committee hearing in December. “You cannot set foot in Indian country without hearing a heartbreaking story about this growing problem. Twenty-four doesn’t sound like a lot in a state of a million people, (but) if you (projected) that out through the (overall) population, that would be a ton of folks. We gotta find a solution to this.” The bill would require the Department of Justice to mend law enforcement protocols and data collection of slain or missing Native Americans. Only 116 out of 5,712 reports of slain or missing Native American women were logged into the Department of Justice database. The bill, called Savanna’s Act, was originally introduced by North Dakota Senator Heidi Heitkamp in 2017 and passed in the Senate, but was blocked in the House. Savanna’s Act was named after Savanna LaFontaine-Greywind, another victim. She was abducted and killed in Fargo, North Dakota at 22 when she was eight months pregnant. “There is an unacceptable level of violent crime and domestic abuse in American Indian and Alaska Native communities,” said Deputy Associate Attorney General Jesse Panuccio. “We are committed to reducing violent crime and improving public safety.” The Department of Justice has said it has taken steps to address the problem, announcing a total of grants worth more than $113 million to advance public safety, assist victims of crime, and forward efforts to reduce violence in Native American and Alaskan Native communities in Sept. 2018. However, if this funding did go towards the right causes then why haven’t efforts increased in searching for the missing and why is this the first time that I am hearing about it?